It’s not often that you can get a one-of-a-kind couture fur creation for less than the price of a fast-fashion t-shirt. Fashion design students Michons, Charlie and Dane created seven pieces by re-fashioning and re-purposing forgotten fur garments, as part of the FuRRR Real design challenge for Social Media Week. Given that it’s 11:59 pm on Feb 12th, you’ve got exactly 24 hours to get them before they are gone – the auction ends on Sunday night. Bid now and support the future of fashion. You can tell FT how you were one of the first to buy their pieces when they interview you at Fashion Week, five years from now. Cape-able: Red and black cape by Michons with leather and fur accents. Photo by Matt Yang. Linen and fur vest by Dane. Photo by Rebecca Wong. Chic and cheeky: a marriage made in heaven? Photo by Rebecca Wong. Fur collared coat by Michons. Photo by Matt Yang. One of my favourite colour combinations - red and grey. Coat by Michons. Photo by Matt Yang. 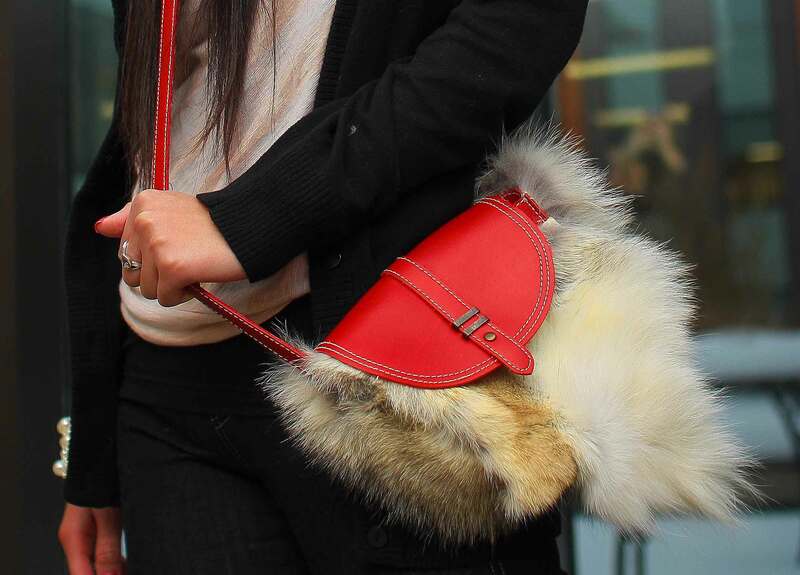 Luxessory - coyote fur purse by Charlie. Photo by Matt Yang. The shoot was also styled, photographed and modelled by Ryerson students. Monday’s snowy weather in Toronto provided the perfect backdrop, don’t you think? Previous Post It’s FuRRR Real…No, RRReally!